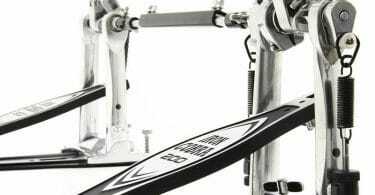 In this article we will go over the best in-ear monitors for drummers and find what’s best for your budget. Whether you are just searching for headphones or a full in-ear monitor system, there is something for everybody. Once I tried in-ear monitors for the first time I knew I was hooked and there was no going back. The higher price-tags might scare some people, but between the noise cancelling and incredible sound quality regular in-ear headphones just don’t compete. There’s a reason why almost all professional musicians use them on stage and in the studio. Whether you want to play with your band, jam on your own, or just listen to music at a higher quality, there are some great options out there for everybody. In-ear monitors are essentially half-headphone, half-earplug. They are headphones that you put in your ear in order for you to hear a balanced live mix of the instruments on stage, all while providing hearing protection because of the barrier created. It’s important to note that they differ from regular in-ear headphones internally. They are a little more pricey, but have much more advanced drivers and wider frequency ranges. Most professional musicians wear a wireless receiver and have their monitor headphones plugged into it. There is then a transmitter backstage somewhere that beams the music or instruments right to the receiver and to their ear. 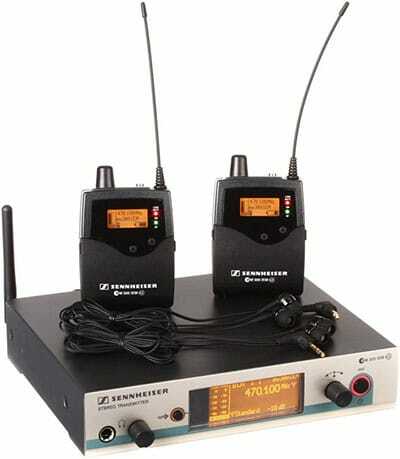 Almost all professional musicians use in-ear monitors, and they are an essential part of any live performance. Below I’ll go over the best in-ear monitors for drummers and explain the benefits of using them in detail. What Are The Benefits Of Using In-Ear Monitors? One of the biggest benefits is that you’ll get an accurate sound representation of every instrument. This means that you don’t have to worry about being too close or too far away from the speakers and you don’t have to worry about the instruments being drowned out by the cheering crowd. You’ll hear exactly the same mix no matter where you are on stage, and the instrument levels will be balanced exactly how you like it. Another major reason why musicians use in-ear monitors is because of the hearing protection capabilities. Did you ever get that ringing in your ears after being exposed to a very loud prolonged sound? That’s called tinnitus and it affects a very large percentage of musicians. If you aren’t careful about protecting your ears you can develop serious tinnitus and hearing loss problems later in life. 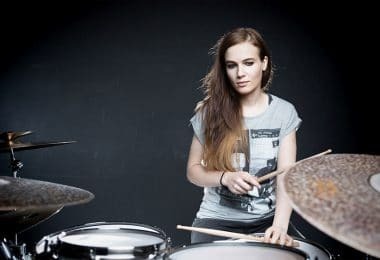 While not really necessary for drummers since we don’t do a lot of moving around, the wireless capabilities in most in-ear monitors are great since it means musicians can move around freely and not need to worry about wires holding them back. The range and clarity of most IEM (in-ear monitor) systems can easily reach out to a few hundred feet. 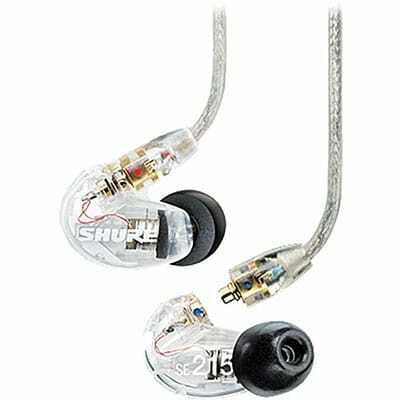 If you have a tight budget but still want some decent sounding in-ear monitors, the Shure SE215-CL are a great choice. As far as the construction goes they are pretty solid. The wires are detachable which is great if you ever need repairs. The earbuds sit deep in your ear canal so they don’t stick out like other IEM’s do sometimes. These are definitely bass-heavy which might be a problem if you are listening to something like heavy metal where the bass will drown out some of the other instruments. The sound quality here won’t compare to the other options on the list, but for the low price it’s hard to look past. 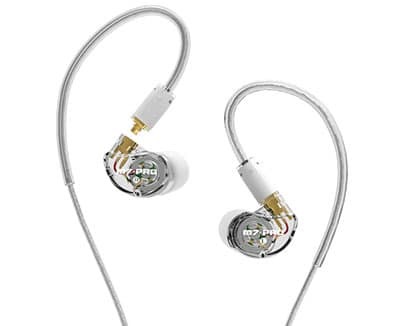 As a successor to the M6 in-ear monitors, the M7’s bring a much stronger and more balanced bass. They feature hybrid dual-driver technology which means it has one dynamic and one balanced armature driver. While the dynamic driver is best at bass, the armature handles the high-end with ease. Usually you have to pay a premium for this type of technology but for the price here it’s an amazing deal. 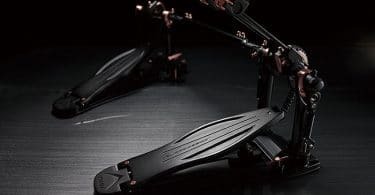 They are super comfortable, and between the 7 different tips you can choose from you’ll find a perfect seal and they won’t budge as you move around. I would have liked to see the mid-range a bit more focused, but honestly it’s not a huge deal since the lows and highs sound so good. One huge plus is that MEE offers a lifetime replacement. According to their site, if your headphones get “crushed, shredded, fried or simply left behind” they will give you a new pair at half price. This is a great deal if you are ever worried about losing or damaging yours during your travels. 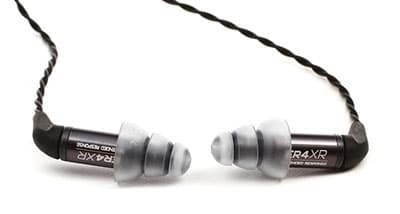 Etymotic first launched their ER-4 line in 1991, and it was the first high-fidelity in-ear monitor that became available to the public. 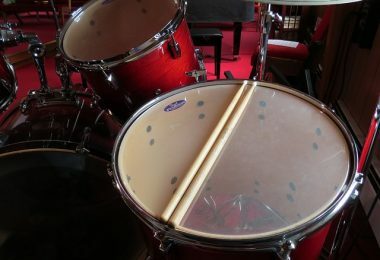 The “XR” in their latest version stands for “Extended Response” and these new drivers give a nice boost to the low end. The machined aluminum body is durable and lightweight, and the new MMCX connector means that replacing the cable if needed is very easy. The soundstage on these are huge, and they are extremely versatile and suitable for all types of music styles. You can choose from 2 sets of triple-flanged ear tips which offer a very flat sound response, or you can opt to use the foam tips for greater isolation and boosted bass. The sound with the foam tips is incredible and that’s why these monitors get my vote for best sounding in-ear monitors. There aren’t very many monitor systems that come as cheap as this. You’d usually expect it to be terrible, but these are actually a great steal if you are looking for a budget wireless monitor system. The setup here is very simple. You get your belt-pack, and the base unit has just one control for switching between 6 different frequencies and one stereo input jack. The box also included some in-ear monitors to use as well. On the belt-pack you can select your channel the screen will tell you what frequency you’re using. There’s a handy LED light on top that lights up green when you are connected to the main unit, and it will turn red if you are on an unsupported channel. Like most wireless monitor systems you’ll want to pick up some rechargeable batteries. Otherwise you’ll be chewing through regular batteries like crazy - not something you want with an in ear monitor for drummers. The range on the S2 is great - you can get out to about 200 meters with line of sight before you’ll start to notice any break-up in the signal. One of the downsides to this cheap unit is that it has some sort of limiter applied. 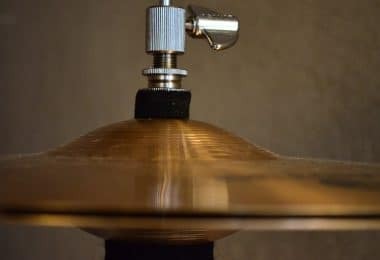 While this is usually a good idea, the release on it is a bit slower than I would like which means that there will be a longer dropout of sound if there is a large spike like someone dropping a microphone. In an ideal world the release would be nice and fast so you can get back to listening to the music faster. Not many years ago this type of unit would have only been accessible to the top musicians in the world who could afford such a luxury. Luckily Shure pulled through and created a version that most people can afford. Settings on the belt-unit are pretty simple. You’ll get a 2-band EQ, stereo balance, and you can even mix 2 separate audio sources together - say for example if you want to hear the guitars a little louder. 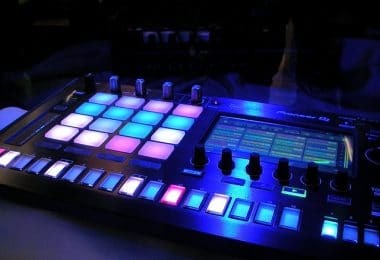 Essentially each musician can create their own personal mix. The range of the transmitter is great for most cases at about 300 feet. It has the usual stuff like channel selection, LCD display, grouping, and it comes with a Sync button which is great for easy setup. The earbuds that come stock with it (SE112 sound isolating earphones) are great quality and very comfortable. 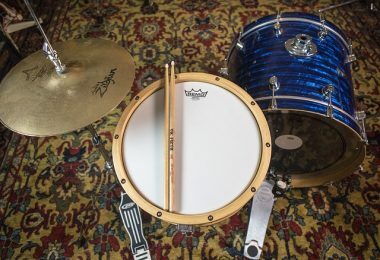 When it comes to in ear monitoring for drummers, it's hard to beat this combo. Sound quality is fantastic overall with the EW 300. One feature I love is that the settings are locked away behind a cover where the batteries are located. This means that you won’t have to worry about accidentally nudging one of the controls and all you have to worry about is the on/off/volume knob. Construction here is solid as well with both the transmitter and receive being made of metal. You can rest assured that you won’t have to deal with any RF interference. The transmitter is pretty simple. It features a sync button for easy setup with your receivers. It has both XLR and a 1/4th inch cable input along with 1 antenna. The antenna is also detachable meaning you can set up a remote antenna for better range and a clearer signal if needed. Conclusion - Which In-Ear Monitor Is Best For Me? Whether you are a gigging musician or just somebody who appreciates great sounding audio with hearing protection capabilities, there are IEM solutions for everybody. 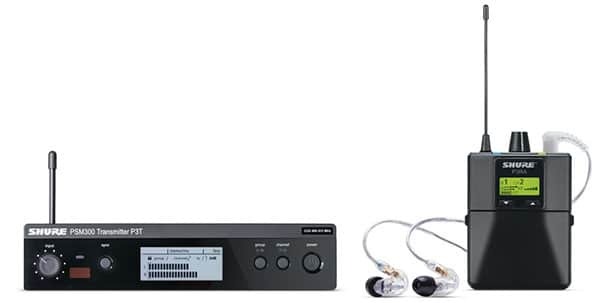 If you already have access to an in-ear monitor system and just need some great sounding headphones to go along with them, sticking to the ones in this list is a good idea since they are highly regarded and made specifically for musicians. Regular headphones aren't going to give you the same clarity and noise isolation you need on stage. If you just want to upgrade your headphones for listening to music these can also be a great idea, but keep in mind that because of the advanced drivers they are what they eat. If you listen to music streaming from something like Pandora you’ll probably hear all of the digital artifacts that come along with it, but if you listen to high quality FLAC tracks on your computer your ears will be in heaven. 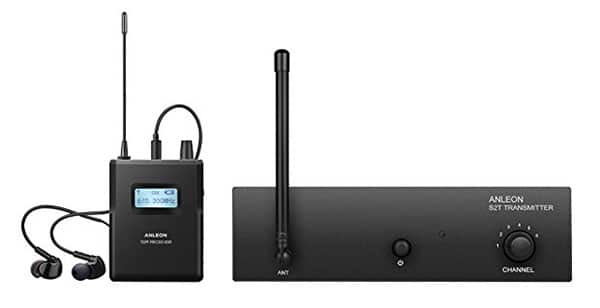 For those gigging artists out there, I’d highly recommend picking up a full system both for practice and on the stage - even if it’s just for backup. Having a set in your gig bag will be a lifesaver if the house system goes down for whatever reason.